A cable technician who was working in a customer's basement got a shock when he saw a more than 500-pound bear staring at him. Dave Cornine, who works for Cablevision, was working in a Hopatcong, N.J. residence Wednesday when he heard growling noises. He poked around with a flashlight, and discovered a grumpy adult male bear, who was sleeping. "I think when I drilled the hole through the floor, I probably woke him up. Because I turned around with the flashlight and ... I just freaked out. I threw my tools, ran out of the basement," Cornine told CBS station WCBS in New York. Animal control officers responded to the scene to subdue the animal, but that proved difficult. The bear sprinted out of the home after being shot with two tranquilizers and led officials on a chase through the neighborhood. 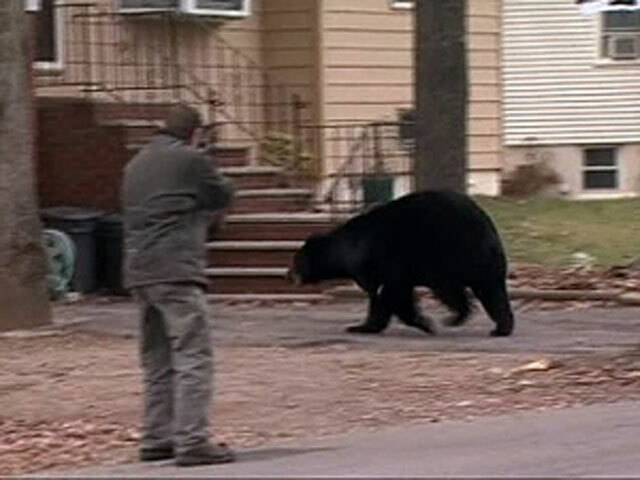 Officers estimated it would take 15 minutes before the tranquilizers would kick in, but 45 minutes later, the bear was still romping around the neighborhood before finally succumbing. "Big-time bear chase and there's nothing better than a bear chase. But I hope it comes out to a good ending because this is one of the most beautiful animals I've seen in the history of probably Hopatcong -- he's beautiful. He's the biggest girthy bear I've ever seen," resident Joseph John Justin told WCBS. Animal control officers added that the bear seems healthy, and will be released into a state property after he is given a medical exam.